According to Jen Hitchcock, stepping into Book Show is like taking a peek inside her head. Amid decor that nods to circus and sideshow culture, the quirky Highland Park bookstore’s tables and shelves are filled with new and vintage finds, everything from serious feminist lit to Partridge Family paperbacks from the ’70s. “That’s essential literature for everybody,” she jokes of the latter. Since the 2016 election, Hitchcock, like many other people, has had politics on the brain. “When Trump got elected, I started a group called Angry, Nasty Women Writing Group,” says Hitchcock, estimating that about 30 people showed up to the first event. 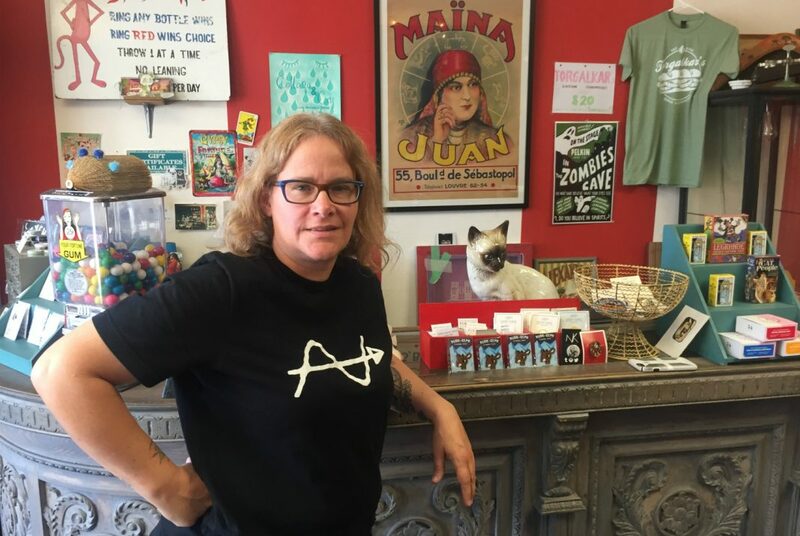 That group is currently on hiatus, but the store itself is home to other events ranging from poetry readings to craft nights. She thinks their success might be related to the current political climate in the U.S. “There’s a need for community, nights like that where you can just come, do art do something with your hands, talk about stuff,” she says. In the summer of 2017, the store hit a rough patch. The aftermath of the previous year’s election was still reverberating, and the the stretch of Figueroa where Book Show is located was in the midst of change. Older stores closed, and new places weren’t quite open yet. “There were a lot of people that got displaced,” she recalls. “There weren’t a lot of people around.” On top of that, plumbing issues from the unit above the shop led to flooding, with water flowing into the store. Hitchcock turned the tough time into an opportunity for further community building by starting a pay-it-forward program. If you want to support the store, but you still have a pile of books to read at home, you can chip in for books that will go to those who can’t afford to buy one. It’s a low-key way to keep business going while helping out others. She’s been working on other ways to help get books into the hands of people who don’t necessarily have access to them. In September and October, the store collaborated with artist Fin Lee on a drive for LGBT Books to Prisoners. They spent about a month taking donations and then hosted an event where people gathered to pack up the books and write letters. Hitchcock estimates that they filled up 15 or 16 boxes with items ranging from best sellers to LGBT-centric nonfiction to blank journals. There are plans in the works for next year, like bringing in a queer movie night and, hopefully, working on more book drives. “This is a part of me and it’s my social life and I think probably in the new year, I’m going to do my best to keep it the same,” she says. Note: Book Show is closed Wednesday-Friday, November 21-23, for the holiday, and reopens Saturday at 11 a.m. for Small Business Saturday. Next articleHow Does California Clean Up After a Disaster Like the Woolsey Fire?